Customized black & white 64” arc vented golf umbrellas are sought by large number of businesses for promoting their brand because this color combination is popular and easily gets noticed, too. This umbrella features nylon fabric, manual open function, windefyer vented canopy, wooden handle and fiberglass frame. Marketers who have never tasted success with their big budget campaigns can always rely on logoed promotional black & white 64” arc vented golf umbrellas because it’s never going to let them down. 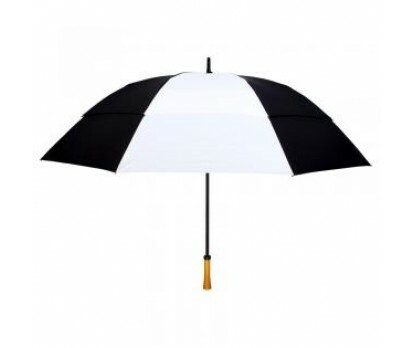 Personalized black & white 64” arc vented golf umbrellas make a good sales hand out or corporate companies can choose to gift it out to their employees as a part of goodwill gesture. Black and white combination is definitely going to win in either of the cases. Imprint area - 10"W x 5"H. Dimensions - 64" arc - Closes to 42".